I have always been a fan of writing prompts.They’re a great way to jog your muse into getting something down on paper. Now that I’m a published author, I force myself to write daily, if I can, and try not to let too many days go between finishing one story and starting another. But when I was younger — when I knew I wanted to be an author but didn’t quite know how to get there — writing prompts helped me combat the fear of staring at a blank page for hours on end. They moved me past the wanting to write something stage into the actually starting a story stage. Of course, it was years before I really finished a story, but at least I had a lot of practice beginning them! The one problem I often had with writing prompts was picking one. I find it difficult to settle on any one prompt to work on at a time. I’ll find something, think it sounds good, then flip the page and find another prompt that looks just as promising, then turn to another page … you get the drift. I’m easily distracted, and would rather read through the entire book of prompts rather than pick one out at random and write. When I began this book, I decided to eliminate that indecisiveness, in case other writers suffer from it as well. I thought if I wrote the book in a diary or planner format, with one prompt per day for an entire year, then it would be a no-brainer which prompt to use. Whatever day it happens to be, flip to that page, and viola! Instant inspiration. The idea, of course, is to write everyday. It’s only by writing that one becomes a writer, and practice makes perfect. Even if you aren’t working on a particular story, writing a brief scene or a short 1,000-word story is a great way to stay in shape and hone your writing ability. It also gets you into a routine, and writing daily will sooner or later lead to a finished story or book. It worked for me, and if you’re having problems finishing a story, maybe take a look at some writing prompts to see if they can’t help? 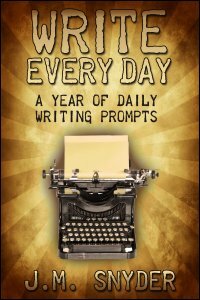 I know a place where you can find 366 prompts all in one place … Write Every Day: A Year of Daily Writing Prompts by J.M. Snyder.